One Liberty Plaza, formerly the U.S. Steel Building, is a skyscraper in lower Manhattan, New York City, at the location of the former Singer Building (in 1968, the third tallest structure ever demolished). 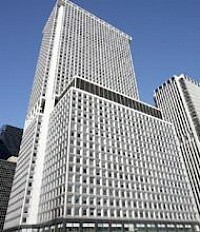 One Liberty Plaza is currently owned and operated by Brookfield Properties. The building is 743 feet (226 m) high and 54 floors. It was built in 1973. 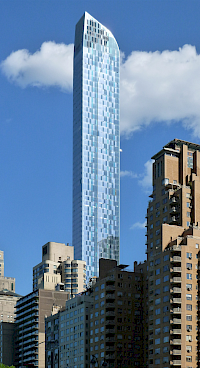 1 Lincoln Plaza is a mixed-use, commercial and luxury residential condominium building in New York City with 43 floors and 671 units. Construction began in 1971. 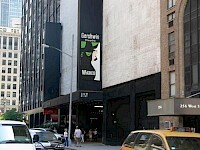 The building is in the heart of the Lincoln Center neighborhood. Completed and ready for occupancy in 1974, the building is divided into eight floors of commercial space and 36 floors of luxury residential apartments. 1 Penn Plaza is a skyscraper in New York City, located between 33rd and 34th Streets, west of Seventh Avenue, and adjacent to Pennsylvania Station and Madison Square Garden. 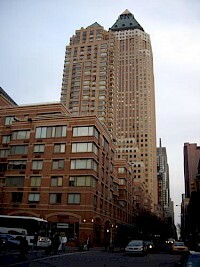 It is the tallest building in the Pennsylvania Plaza complex of office buildings, hotels, and entertainment facilities. The skyscraper was designed by Kahn & Jacobs and completed in 1972. It reaches 750 feet (229 m) with 57 floors. The tower has three setbacks at 7th, 14th, and 55th floors. 1 William Street is an office building located in New York City. The building, completed in 1907, was built for J & W Seligman, an investment bank. In 1928, the building was acquired by Lehman Brothers, another investment bank, which remained headquartered there until 1980. 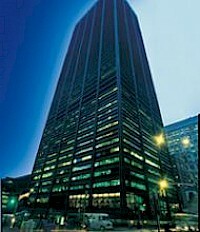 The building is presently owned by Intesa Sanpaolo, Italy's largest bank. In 1996, the building was designated as a landmark by the New York City Landmarks Preservation Commission. 1 World Financial Center is a skyscraper in Lower Manhattan, New York City. It is located at 200 Liberty Street between South End Avenue and West Street. It was built in 1985 as part of the World Financial Center complex. 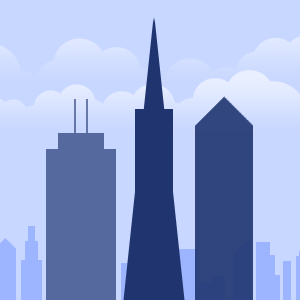 It is a 40 story building reaching the height of 577 ft (176 m). It has a leasable area of 1,628,000 ft² (151,000 m²). Similarly to other WFC buildings it has a unique roof which is a flat-top pyramid. One Worldwide Plaza is part of a three-building, mixed-use commercial and residential complex completed in 1989, in the New York City borough of Manhattan, known collectively as Worldwide Plaza. 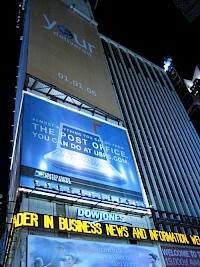 One Worldwide Plaza is a commercial office tower on Eighth Avenue. Two Worldwide Plaza is a condominium residential tower west of the center of the block, and Three Worldwide Plaza is a low-rise condominium residential building with street level stores on Ninth Avenue, to the west of the towers. Paramount Plaza (formerly the Uris Building or 1633 Broadway) is a 48-story skyscraper on Broadway in New York City that houses two Broadway theatres. 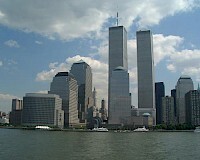 In 2007 it was listed as number 46 on the List of tallest buildings in New York City. The building, designed by Emery Roth and Sons, was built in 1970 on the site of the Capitol Theatre movie house by the Uris brothers who at the time claimed to be the largest private developers in New York City.